Hello. My name is Franco. I am an ice cream addict. If there was a Ice Cream Anonymous, I would be a charter member. My love for ice cream is that serious. It was bad (but so good) as child but as an adult (luck enough to own a Ice Cream Maker) it is a borderline obsession. Now, I am privileged to not only enjoy eating ice cream but also making it as well. When it comes to buying ice cream. I have a standing rule. I don’t buy what I can make. Thus, for me to go out and buy a pint (or more), it has to be really good. I just made a batch of home made Dulce de Leche with Pecans for my sister’s family. They loved it. My current store bought favorites are Sebastian’s Ice Cream Up All Night (coffee flavored) and Butter Pecan. So when the craving for ice cream hits you, where do you go and what do you buy? Rustan’s Supermarket to buy Ben & Jerry’s Coffee Heath Bar Crunch or Chocolate Chip Cookie Dough. Because it’s frequently unavailable, it makes me want it more. If those are not available, then default to Haagen-Dazs White Chocolate Raspberry Truffle or Dulce de Leche. The rest of the supermarket ice creams are for pigs. For me, there is no one else in the super premium ice cream category. The Sofitel [Philippine Plaza] chef makes outstanding ice cream with weirdasss flavors, none of which i can remember. But, who wants to drive to Sofitel? Last but really not least, the gelato selection of Amici’s is great and affordable, as is their collection of 1960’s style Italian liqueurs like Fernet-Branca(what a surprise, Italian priests making gelato and stashing liquor). FIC Mixed Berries or Magnolia Strawberry. My depression medicine used to be Belgian Chocolate of Haagen Dazs but now I find it too sweet. My gut reaction to your question is Haagen Dazs. In the ice cream wars between HD and Ben and Jerry’s, I’m in the former camp. Do I blame my mother who gave me a HD vanilla and almond bar the first day I moved to the US? Or the countless pints of coffee HD that sustained me through final exams in college? While I won’t pass up Ben/Jerry’s if offered I won’t seek it out. I prefer the “less is more” approach that Haagen Dazs offers. Clean flavors, with premium ingredients. Each spoonful of Vanilla HD is like a drug. Table for 3 recently wrote up about Sebastian’s Ice Cream of Ian Carandang. I met Ian through Lori Balthazar last year (at her cookbook swap), and have been thankful for that encounter. First of all, how many people out there make their own ice cream? And second, how many of those folks making ice cream are as obsessed as Ian? He’s got the vision, he’s got a feel for what makes ice cream lovers like me happy, and he’s even willing to let us bug him with flavor requests when we have ingredients to spare. I’ve had Hazelnut and Fig ice cream flavors created by Ian. He doesn’t fiddle with it by adding nonessential items; it’s simple, luxurious, and fun. As for gelato, there are few purveyors of it in town, not all of them are consistently good – which is understandable since the quality of the ingredients is important in making small batches of gelato. For now, I find myself jonesing for the Lemon Sorbet at Gelantone. It’s a flavor not a lot of Filipinos like because it’s tart. But add it to the vanilla or one of the fruit based gelatos and you have a ray of sunshine in a cup. What better way to hide from work, traffic, noise and life in general than by sitting inside their little store and tucking into a double scoop, watching people walk by. And if you can’t afford a double scoop, much less one scoop at Gelantone, a less expensive option is over at Amici on Pasay Road, which sells a scoop for P45. Just don’t get the coffee! I find it has a weird taste of cigarette butts. I’ve enjoyed their Pistachio, Chocolate, and Rum flavors. I’m not the kind of person who can have ice cream everyday but when I find myself wanting some I like to buy gelato…I find it less cloying then regular ice cream. I used to just get some at Pazzo (in Rockwell) but now there are more gelato places opening. Good for me! Hehe 🙂 And although I will peruse each and every flavor when I go, I will more often than not, end up getting Chocolate, the darker the better. Of course, this was all before Sebastian’s Chocoholics Anonymous entered my life (Hi! My name is Joey and I’m a chocoholic!). Dark as sin and more chocolate-y than any other local ice cream I’ve tried…it is truly a miracle in chocolate. Sebastian’s Butter Pecan is another favorite…tastes like actual butter, instead of just sugar! Depends. For Gelato, it’s the Biscotti from Pazzo. For ordinary ice cream, it used to be the Pistachio from FIC, though now any damn flavor from Sebastian’s has my vote. Thanks to Senor Macho, Salamia, Watergirl, Anton, ChichaJo, Stich and Kate for sharing their ice cream/gelato favs. do twin popsies count? :-) really crave those on a hot day. do they still make them? chocolate and orange ... yummmmmm. i also like the ice cream at spiral. where can i buy an ice cream maker? that sounds like a perfect Christmas gift ... to myself! I won't even mention the ice cream maker! It has been corrected. Sorry about that. Although technically not an ice cream, I still have great memories of that frozen delight as well. As for the ice cream maker, I remember seeing one in Rustan's. It was small and a hand crank version. :P So, you might be better off buying ready made ice cream. Best bet. Order from Amazon. Margaux, twin popsies definitely count! I love the chocolate ones. wow, there's a sebastian's fan club here! :) i've yet to explore ALL their flavors, but so far, i heart the chocolate chip cookie dough. my faves: ben & jerry's vanilla, ben & jerry's cherry garcia, the green tea and vanilla at omakase (they make their own), green tea soft serve at kozui, amici gelatos, and haagen dazs belgian chocolate. yuuuum. Thanks for helping out. I love the orange flavored one myself. True about the fattening part. But, life is too short to deprive yourself. :) Personally, I just exercise more. Becky, I fell in love at first bite with green tea ice cream when I first tasted it many moons ago. I've tried the one at Omakase and it's excellent! if you like gelato, i recommend DOLCE GELATO at mall of asia. in my opinion, they have the creamiest, most flavorful gelato in Manila. all their ingredients come from italy. 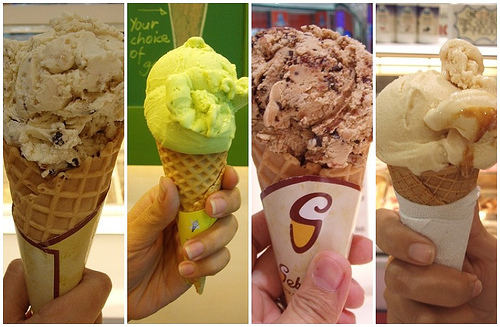 The must-have flavors are the Ferrero Rocher and Pistachio. soooo good! and the best thing about it is you can COMBINE up to 6 flavors with no extra charge! !